Sunpenny Publishing Group: Book signing event in the north of Scotland! It's always great to hear when our authors have been out and about at book related events, so we were very pleased to hear that our own Stephanie Parker McKean has just had a successful book signing event at a bookshop in Cromarty, a town in the north of Scotland near to Fortrose, where Stephanie and her husband, Alan, live. Here's a link to a local map to give you an idea of the location. 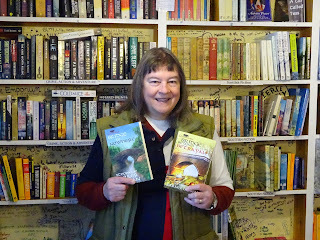 Judy Harvey, owner of The Emporium Bookshop in Cromarty, hosted a joint book signing for Stephanie and her husband Alan on Friday, March 3, from 10:30 a.m. to 12:30 a.m.
Stephanie’s Sunpenny books include the first Texas Miz Mike, “Bridge to Nowhere,” and the second Texas Miz Mike, “Bridge Beyond Betrayal,” which is dedicated to her late son USMC Major Luke Parker. Texas Miz Mike books are great fun and rollicking good page-turners. They are also clean reading, so suited to all ages and tastes, and are mystery-romance-suspense spun around a Christian core as are all Sunpenny Publishing's Rose & Crown books. "I have never been to Texas but having just finished "Bridge to Nowhere" I find I have a real hankering to discover if Texans are anything like as fun and quirky as the characters in the novel. Miz Mike is a lovable heroine. She shares with me a love of chocolate and being unable to keep her nose out of other people's affairs, which gets her into many interesting "pickles". How to describe Miz Mike? She is not young, not the perfect weight. She is capable of great bravery but also often makes misjudgements that she later has admit to. Her imperfections and warm heart make her seem very believable and by the end of the book I really cared about her and her family. The Texan town she lives in is peopled by a cast of amazingly eccentric personalities and Miz Mike falls into one mystery after another as she tries to help find a murderer, whilst not upsetting her son, who thinks she has a penchant for sticking her nose into things. She is a staunch Christian and sticks up for her principles volubly which, although I do not share these strong views, adds to the authenticity of her character. The book is fast paced and a lot of fun. I now want to try out the Friday seafood buffet at "The Spanish Tile" restaurant - it made my mouth water!" "After reading and loving the first Miz Mike book, I was confident I would love the second too. I did. This book is so exuberant and charming. Miz Mike is a delightful character: gutsy, feisty and savvy, but refreshingly innocent too. She never understands why people think she cannot 'mind her own business' and sure enough, she gets into a 'pickle' over the murder of a health supplement tycoon. Her deep sense of justice when the wrong man is arrested gets her into a whole heap of scrapes. This includes an emotional one when love of her life, Marty lets her down and the charming Frank steps into claim the role of knight in shining armour. Ms McKean has created a lovely setting in Three Prongs with wonderful, colourful characters. I enjoyed every page of this murder mystery and am already looking forward to the next one! She proves that you do not need shocking brutality and violence for an addictive and compelling read!" Thanks, Val Poore. This is great, not just because it's about me, but because it gets Sunpenny and Sunpenny authors back into the spotlight. What a lovely event! Sounds like it was fun too! I never knew you lived so far north until I looked at the map, Stephanie! What a beautiful area, but a bit colder than your native Texas, I think!